QUESTION?..... Why do some people seem to move quickly up the corporate ladder while others with equal qualifications get left behind? Often the difference can be attributed to and social competence. Now is the time to polish your professional image, and establish your credibility and believably. 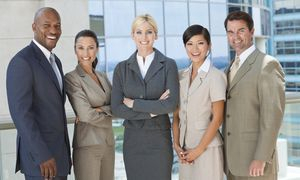 Boost your social savvy and learn to project credibility and competent through your professional image areas such as civility, corporate courtesies, social intelligence and modern manners. Boost your business by learning to be believable and establish a character, charisma and credibility that is influential to others. Human resources and/or workplace trainers looking for new training tools to motivate and mentor their team. How to present credibility and confidence. The nuances of effective communication considering: technology, diversity, and office politics. Avoid social and business faux pas that can cost your reputation. Leverage your social savvy and be more socially competent. GET PROMOTED - Gain the skills required for a competitive advantage and sell yourself. INCREASE YOUR INCOME - Opportunity to increase your "Salesablity" and "Profitability" and influence Impact and profit. Start Now and gain your competitive edge. Five hours supports and solutions to help you accelerate your business and profits. Custom one on one approach includes an orientation, assessment and an agreed upon course of action. All phases of the program are covered each time and the focus on achieving agreed-upon goals never waivers. However, the exact duration and content for each phase is adjusted and customized to the requirements of the individual with the program. You are 100% responsible for your success. We only show you a different way to do business. Click Here to read our disclaimer.. Click Here to read our disclaimer. © 2019 Powered By Jessica. All Rights Reserved.